July 6, 2013 – Hollywood, CA: Today’s 4th of July Weekend Festival at Celebrity Centre International was co-produced with Artists for a Better World. Arts and crafts activities for kids were featured, which included painting and drawing, as well as a clay sculpting table provided by Jule Rotenberg. Artists For A Word members, Dave, Caleb and Celeste Repchuk, ran this area. Dave Repchuk and Franklin Hoyt also displayed their original paintings. When kids were not busy creating works of art they were spending their time at the water slide, petting zoo, riding ponies, or taking part in the water melon eating contest. Noelle North ran the popular photo booth where attendees could wear various hats and have their pictures taken against the back drop of an American flag. 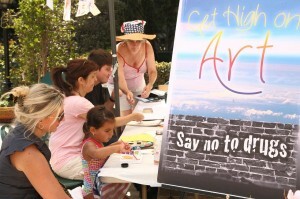 There was a Get High on Art, Say No To Drugs booth where both kids and adults could do drawings which forwarded the message of “encouraging the creation of art” and “discouraging the destruction of drugs”. This area was manned by Becky Mate with the help of Boris Radenovich. Paul Godfrey and Marci Dean ran The Way to Happiness booth, and presented an array of booklets with various covers, where they promoted this social betterment activity. Embellishing the festival were a variety of musicians that included: A band with Tim Corbo, Mark Simonian, Bud Hayes and Kevin Corbo. Also singing with them was Luba Meltzer. Other musicians who performed were Barbara Cordova Oliver, Shana O’Brien,The Insito Lirikal Group and duets with Rachel Lindley and Madison Johnson. Other AFABW volunteers helping at the fest were Christina Hoyt and Jane Gall.